SEOUL, July 25 (Yonhap) — A South Korean private committee said Wednesday that it will file a lawsuit against North Korean leader Kim Jong-un with the International Criminal Court in September. The move is designed to put pressure on the communist country to repatriate the hundreds of South Korean soldiers taken prisoner and the remains of those killed during the 1950-53 Korean War, said Park Sun-young, a former lawmaker who has championed the rights of North Korean defectors and South Korean prisoners of war (POWs). The committee, which calls for the return of the South Korean POWs, also said it plans to present a petition to the United Nations Human Rights Council on the issue in the fall, said Park, one of about 50 committee members. “The pressure will be enormous,” Park said after a news conference in the National Assembly as she vowed to make efforts to try to bring home aging former South Korean soldiers. South Korea estimates about 500 POWs are believed to still be alive in the North. Pyongyang denies holding any POWs and claims former South Korean soldiers voluntarily defected. Park claimed former South Korean soldiers toil in mines in the North, citing testimonies of some of the 56 former POWs who escaped to the South after spending decades in the North. The war ended in a cease-fire, not a peace treaty, leaving the two Koreas technically still at war. She also said the committee plans to upload testimonies of former South Korean POWs to YouTube to raise international awareness of the issue. Choi Eun-suk, a North Korea legal expert at the Institute for Far Eastern Studies at Kyungnam University, said he did not think it is impossible to pressure the North to return former South Korean soldiers. He did not elaborate. The man before me is not yet 30. He stands, perhaps a little unsure of himself, a nervous tic in his shoulders seeming to betray his unease. Before him is one of the largest armies on the planet. It is a war machine, still fighting a battle from more than half a century ago. They move in lockstep, legs kicking and arms swinging as one, discipline and focus measured in millimeters. A vast arsenal of weapons, missiles and tanks, pass by. The cost of this show of military might has been paid in the suffering of the people it is primed to defend. Aid groups say thousands have starved here; meanwhile, the army has grown fat. The young man eyeing all of this is master of all he surveys. This is North Korea, and the man is Kim Jong Un. This was a rare glimpse indeed of a man who now rules the notorious hermit kingdom. In April this year, North Korea opened its doors to the world’s media. CNN was there to cover the celebration of the 100th anniversary of the birth of the country’s founding father, Kim Il Sung. The eternal president and “Great Leader” had passed power to his “Dear Leader” son, the erratic, eccentric Kim Jong Il. Now a third generation Kim, the so-called “Supreme Leader,” stood on the shoulders of his forebears. He gained power by birthright, but the world is watching as he attempts to rule in his own right. His soldiers certainly pay lip service to their loyalty. These men are combat ready, never forgetting they have a sworn enemy in the United States. “With the strategy of the great leader Kim Il Sung, the dear Kim Jong Il and Kim Jong Un with our bombs and weapons we will destroy them,” they tell me. But beyond the war rhetoric are the realities of leading an impoverished, isolated and paranoid country. As I stood below him at this military parade, my mind wandered to the young Kim’s thoughts. What would have been going through his mind? We’re told he was educated partly in Switzerland, loves music and western movies and is a huge basketball fan. But the country he rules is largely sealed off from the outside world. People here mostly don’t have telephones; they never get exposure to foreign television, newspapers or films. The world is defined by endless statues, portraits and tributes to the cult of the Kims. When CNN visited Pyongyang, North Korea was putting on its most intimidating face. But amid this display of what the regime called power and prosperity was the lone voice of the young leader. For the first time North Koreans heard him speak. This is why he appeared nervous. Kim Jong Un mouthed the usual threats and warnings, but there was something different: an acknowledgment that North Korea must find a better future. “Our fellow citizens, who are the best citizens in the world, who have overcome countless struggles and hardships, it is our party’s firmest resolve not to let our citizens go hungry again,” he said. It was an important, if veiled, concession. Yes, North Korean people had suffered. Yes, the regime was responsible — not just for the past but a better future. “This was really his introduction. A few years ago no one even knew he existed but they’re being told to worship him,” Chovanec said. Our government-assigned minders escorted us around the city. They were there to make sure that what we saw and heard was strictly according to the party line. In North Korea it is impossible to separate what is genuine and what is just for show. In the streets of the capital, Pyongyang, we were given a glimpse of the great future Kim Jong Un was promising. We were taken to bustling neighborhoods, saw families shopping, cars on the street. But all of this only served to hide another harsher reality. Outside this showcase city, life was so very different. In the bleak countryside, aid groups say people continue to starve. Defectors tell of surviving on little more than corn. Children are reportedly malnourished and have stunted growth. All the while billions of dollars are still spent on high-tech missiles and nuclear weapons. This is the essence of this secretive country. Kim Jong Un may struggle to emerge from the shadows of his father and grandfather, but the gun here looms even larger. As young and green as he is, he knows this much: Without it, his rule and the regime itself will not survive. 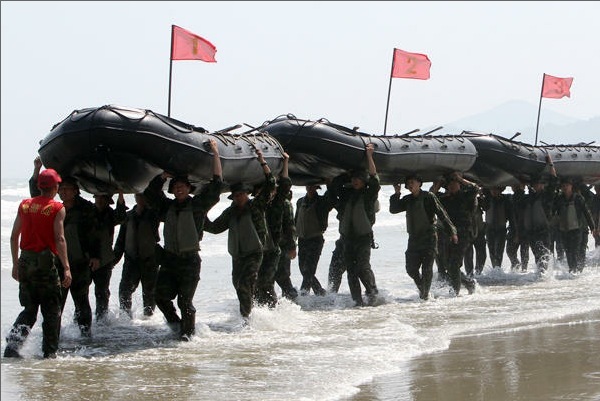 South Korean marines train at Baengnyeong Island near the North Korean border. Photo credit Seo Myeong-gon / Yonhap / AP. South Korea is a little bit smaller than Kentucky, yet it has the sixth-largest standing military in the world. There is only one country that is remotely similar in size with a comparable military: North Korea. WASHINGTON, March 21, 2012 – The United States has suspended efforts to find remains of U.S. service members lost during the Korean War due to North Korean threats to launch a ballistic missile, Pentagon Press Secretary George Little said here today. Recovering remains of those lost and unaccounted for is a priority to the Defense Department, and U.S. experts were due to enter North Korea this month. There is a difficult balance between honoring the dead and the living. 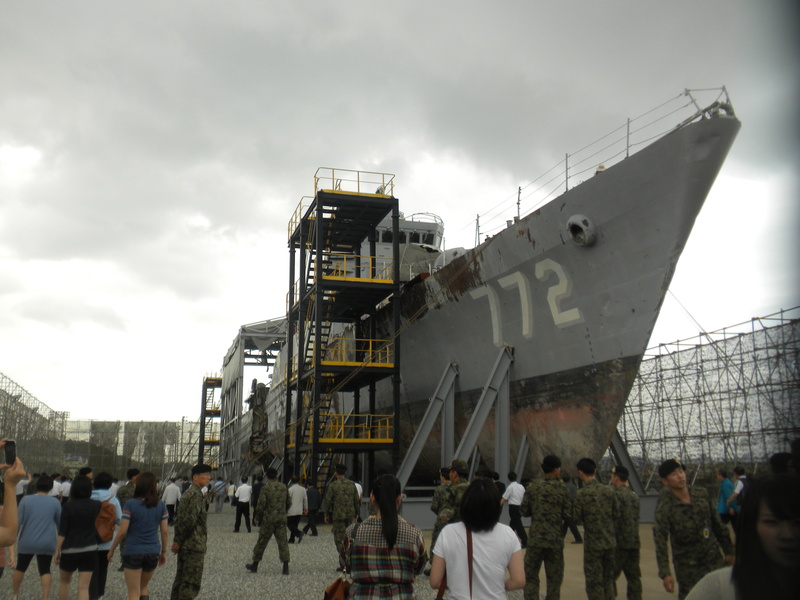 This summer I visited Cheonanham, the memorial for a Korean Navy corvette that had sunk in March 2010. At that time, I had been teaching English in Jeollanam-do. We heard that a ship had sunk off of the coast, and 46 Korean sailors were dead. I remember the televised funeral services. The ship was recovered from the seabed in two halves; upon investigation by an international team (South Korea called in foreign experts to increase the investigation’s credibility), the investigators determined that the ship broke in two from something called a bubble jet, caused by the explosion of a torpedo a few meters from the hull of the ship. The resulting pressure differential tore the ship in two.